This dish is generally prepared with left over idlis.Whenever I prepare idlis I make a huge batch so that the first day we have it with sambhar and the next day is masala idly.. :)This is a very quick and delicious recipe..worth giving it a try. Heat a non-stick pan and fry the left over idlis in some ghee. Once they turn light brown on both sides,chop them roughly into big cubes. Chop the onion, chillies and tomato finely. Add mustard seeds and curry leaves.Let them splutter. Once onion gets fried add tomatoes. Let it cook for sometime.Add salt as per taste. Put in the fried idly pieces. Add some sambar powder,sprinkle little water and cook. You can also add left over sambhar if there is any. Adjust the salt as per taste. 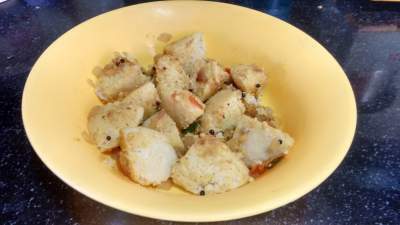 Delicious masala idly is ready to serve.